Malta, officially called the Republic of Malta, is an island nation located in southern Europe. The Malta archipelago is located in the Mediterranean Sea, about 93 km south of the island of Sicily and 288 km east of Tunisia. Malta is known as one of the world's smallest and most densely populated countries, with an area of just 122 square miles (316 sq km) and a population of over 400,000—giving it a population density of about 3,347 persons per square mile or 1,292 people per square kilometer. Archaeological records show that Malta's history dates back to ancient times and was one of the world's oldest civilizations. Early in its history, Malta became an important trading settlement because of its central location in the Mediterranean, and the Phoenicians and later the Carthaginians built forts on the island. In 218 B.C.E., Malta became a part of the Roman Empire during the second Punic War. The island remained a part of the Roman Empire until 533 C.E. when it became a part of the Byzantine Empire. In 870, control of Malta passed to the Arabs, who remained on the island until 1090 when they were driven out by a band of Norman adventurers. This led to it becoming a part of Sicily for over 400 years, during which time it was sold to several feudal lords from lands that would eventually come to belong to Germany, France, and Spain. According to the U.S. Department of State, in 1522, Suleiman II forced the Knights of St. John from Rhodes and they spread out in various locations throughout Europe. In 1530, they were granted rule over the Maltese islands by Holy Roman Emperor Charles V, and for over 250 years the "Knights of Malta" controlled the islands. During their time on the islands, the Knights of Malta built several towns, palaces, and churches. In 1565, the Ottomans attempted to siege Malta—known as the Great Siege—but the Knights were able to defeat them. By the late 1700s, however, the power of the Knights began to decline and in 1798 they surrendered to Napoleon. For two years after Napoleon took over Malta, the population attempted to resist French rule and in 1800, with the support of the British, the French were forced out of the islands. In 1814, Malta became a part of the British Empire. During the British occupation of Malta, several military fortresses were built and the islands became the headquarters of the British Mediterranean Fleet. During World War II, Malta was invaded several times by Germany and Italy but it was able to survive and on August 15, 1942, five ships broke through a Nazi blockade to deliver food and supplies to Malta. This fleet of ships became known as the Santa Marija Convoy. In 1942, Malta was awarded the George Cross by King George VI. In September 1943 Malta was home to the surrender of the Italian fleet and as a result, September 8 is recognized as Victory Day in Malta to mark the end of WWII in Malta and commemorate the victory in the 1565 Great Siege. On September 21, 1964, Malta gained its independence and it officially became the Republic of Malta on December 13, 1974. Today Malta is still governed as a republic with an executive branch made up of a chief of state (the president) and a head of government (the prime minister). Malta's legislative branch is comprised of a unicameral House of Representatives, while its judicial branch is made up of the Constitutional Court, Court of First Instance and the Court of Appeal. Malta has no administrative subdivisions and the entire country is administered directly from its capital, Valletta. There are however several local councils that administer orders from Valletta. Malta has a relatively small economy and it is reliant on international trade because, according to the CIA World Factbook, it produces only about 20% of its food needs, has little fresh water and has few energy sources. Its main agricultural products are potatoes, cauliflower, grapes, wheat, barley, tomatoes, citrus, flowers, green peppers, pork, milk, poultry, and eggs. Tourism is also a major part of Malta's economy and other industries in the country include electronics, shipbuilding and repair, construction, food and beverages, pharmaceuticals, footwear, clothing, tobacco, as well as aviation, financial and information technology services. Malta is an archipelago in the middle of the Mediterranean with two main islands - Gozo and Malta. Its total area is very small at only 122 square miles (316 sq km), but the overall topography of the islands varies. There are for example many rocky coastal cliffs, but the center of the islands is dominated by low, flat plains. The highest point on Malta is Ta'Dmerjrek at 830 feet (253 m). The largest city in Malta is Birkirkara. The climate of Malta is Mediterranean and as such it has mild, rainy winters and warm to hot, dry summers. 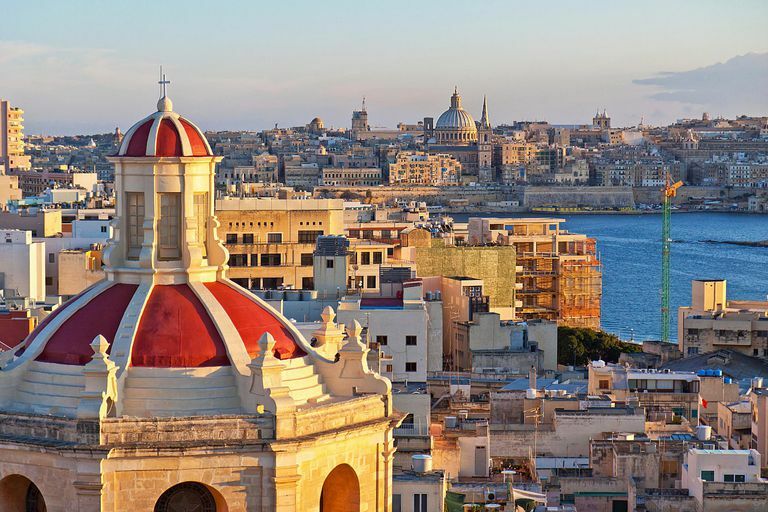 Valletta has an average January low temperature of 48˚F (9˚C) and an average July high temperature of 86˚F (30˚C). Central Intelligence Agency. (26 April 2011). CIA - The World Factbook - Malta . Infoplease.com. (n.d.). Malta: History, Geography, Government, and Culture. United States Department of State. (23 November 2010). Malta . ﻿Wikipedia.com. (30 April 2011). Malta.